First time I heard the name, I had in my head an image of a potato in a dinner jacket swanning around in a party. When the lady in the counter handed it to me I thought - why it's baked potato! And so that was another English lesson for me. 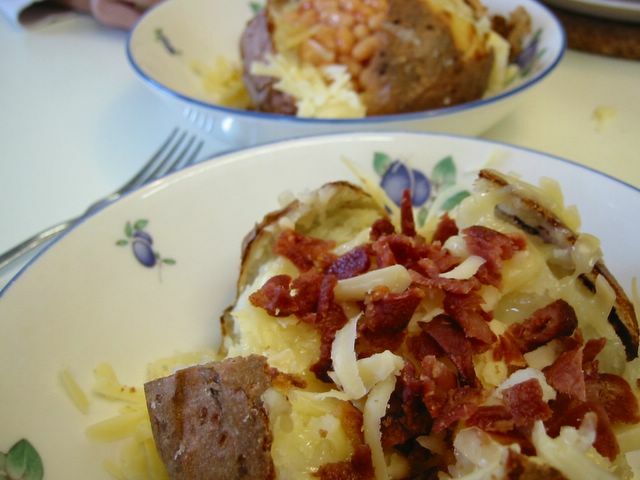 Jacket potato or baked potato is one of those sublime comfort food that you would want to have on a chilly day. Simple, basic but very satisfying. My favourite topping for this would be crispy fried bacon on melting grated cheese, while my youngest daughter loves baked beans on the same. There is a large variety of toppings available in local sandwich shops ranging from the simple grated cheese or tuna mayo sweetcorn to cream cheese with smoked salmon. The humble potato is of course great source of carbohydrates, rich in vitamin C, B, and other minerals like potassium and magnesium. That is mighty fine unless you're in a low carb diet then you'll have to eat this less frequently. Still there's nothing like tucking into a piping hot jacket potato on a cold day. Suggested potato varieties to use are those of the 'baking' type. Usually in supermarkets they have labels on the shelf or the package saying if it is baking potato. Here in UK the more popular ones are King Edward, Maris Piper, and Desiree. You would want your potato to be floury to give you that fluffy inside once you slit the skin and opened it straight from the oven. Preheat oven to 190°C/fan 170°C/375°F. Pierce potatoes all over with fork. [Optional] Put one or two drops of oil on the skin and spread it all around. This will make the skin very crispy. [Optional] Sprinkle (or roll) the oiled potato with a little salt. Bake in the oven for about 1 1/2 - 1 3/4 hours or once a knife or skewer can be easily pushed in the middle of the potato. Take out of the oven and make 2 slits on top made in a cross fashion. Push gently from the sides to open up the cross. Fluff the potato a little and top with butter (optional) and topping of choice. Copyright or Right to Copy?